My son is sitting on the Great Wall of China. Literally. He is on top of the world, 7,000 miles away. In the photograph he sent the sky is bright blue and it’s warm enough to go without a jacket. I hope. The wall winds up and down hills so steep and unending it merges into the horizon. Could the builders have imagined that they were creating something so profound? My son sits astride the wall like he's riding a horse. No, more like a sturdy, old mule. The wall was built 24 centuries ago and is cracked and pocked with holes. Now that I think about it, I don't see how it could be all that sturdy. I wonder if there are any bathrooms there. My son has always been an extremist kind of guy who brooks no middle ground: as a toddler he had a temperature of either 98.6° or 104°—nothing in between; as a kid he was a blur of running feet or a lump of comatose sleep; as an adolescent he spent his school breaks driving a dog sled during record-breaking low temperatures or holed up in his room with the door closed. 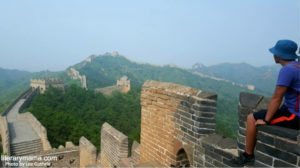 But sitting on The Great Wall, this mature contemplation, this is different. He gazes out into the expanse—out into the future. It's the perfect metaphor for his 22-year-old life that is just beginning, shifting on its axis. He is balanced so far off the ground that just looking down would make some people lightheaded. It makes me lightheaded. But he sits confident, secure. Still, I think: He's young and doesn't know yet. He doesn't know how life can turn on you so unexpectedly, how you can be sitting there, say, on a wall, holding on as best you can, and a sudden gust of bad fortune can come along and tear your life apart. My breath grows short; alarm creeps up my spine. I stare at the photograph, unable to take my eyes off my son, yielding to a mother's fear of what could happen if I look away, even for a moment. I enlarge the image on the computer screen so I can see better. That's when I notice the hat. A blue hat with a brim that casts his face and neck in shadow. A hat that protects his lovely skin from the sun's UV rays. I recall the hot, sun-filled mornings mornings not all that many years ago when he rushed out of the house to his summer job as a caddy and I said, "Don't forget the sunscreen," and then later I saw the sunscreen tube still tucked away in the closet. And in the early evening when he came back home, red as a berry, I asked him about it and he said, "Oh yeah, I forgot." But look: Here he is, wearing this hat that he thought, all on his own, to go out and buy. Relief floats through me, and I sense my tightly coiled muscles begin to loosen their grip. As in the past, when my parental worries weren't borne out, I feel grateful. What surprises me this time, however, what makes me look up from the photograph and stare at the birds chirping wildly out the window beyond my desk, is that my relief is not only about my son, but it's also for and about myself. I feel grateful that he's safe, but I also feel—well—good. Something has changed in the cadence of our relationship, like a gear shifting into a different socket. I've no need to fret about sunburns or lightheadedness, or worry whether there's a bathroom. Nor do I need to stress about balancing 20 to 40 feet above the ground on a 13-mile-long wall. Because I'm not the one sitting on it—my son is. I close my laptop, but the photograph lingers in my mind's eye. My son and I are separated by 7,000 miles, and yet, there's still a connection. We're each finding our footing—our place between the extremes—in a world alive with possibility. Lee Guthrie is a writer whose recent work has been published in Hippocampus Magazine and featured in a production at Piven Theatre Workshop. Throughout her career she has also written content on a range of business issues, performed professionally in many plays, and helped individuals and companies craft and tell their stories. She lives in the Chicago area with her husband, who joins her in trying to keep up with their adventurous adult children.